JACK Compton CAN fulfil his potential but only if he seeks professional help first, says Hartlepool United boss Ronnie Moore. The 26-year-old is leaving Pools after two seasons in the North East after being brought to the club by Colin Cooper. He has immense ability but I have sat openly and said to him that he needs to speak to a psychologist or a psychiatrist and if he gets that bit right then he’ll be fine. But the winger struggled for consistency during his time at the club, dividing opinion among supporters, after failing to regularly produce the “immense ability” that Moore believes he has. Moore insisted he got on well with the former Falkirk, Bradford and Portsmouth winger, but said Compton needs to speak with a psychologist or a psychiatrist if he is to achieve his potential. In the aftermath of the 2-1 win over Exeter City – the game which sealed Pools’ Great Escape – Compton confirmed he would be leaving the club for family reasons. 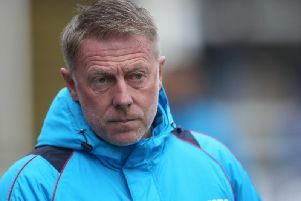 The Pools boss famously labelled him ‘Marmite’ saying you either loved him or hated him, given his inconsistent nature and attitude problems but he believes he will get another club without too much trouble. “I have no problem with Jack, we get on,” Moore told SportMail. “He has immense ability but I have sat openly and said to him that he needs to speak to a psychologist or a psychiatrist and if he gets that bit right then he’ll be fine. “You need consistency and need to be looking after your life off the pitch as well. “If you can’t trust that part of things then I thought it was better we let him go but he will get a club, no problem. Compton, who once got involved in a Twitter spat with teammate Scott Harrison, had missed nine league games after falling out of favour with Moore and spending time training with the youth team. But he made his return in the win against Exeter at Victoria Park. Moore added: “We thank him for his time with us. “Jack won us a couple of games on his own with his great left foot and he puts a great ball into the box. “But you have to have the full package and need to look after yourself when the games are finished. Compton wasn’t involved in the 3-3 draw with Carlisle United on the final day of the season as Pools finished third-bottom in Sky Bet League Two. Experienced striker Marlon Harewood will also be leaving when his contract expires, as reported by SportMail earlier this week, once the Clarence Road club confirms the retained list ahead of the 2015-16 campaign. Moore is anticipating a busy summer as he looks to revamp his squad to avoid another repeat of this season, which saw Pools almost drop out of the Football League, only to save themselves in the final weeks of the season. Pools are set to let several senior players go, as Moore looks to bring in up to nine new signings before the squad returns for pre-season training in July.